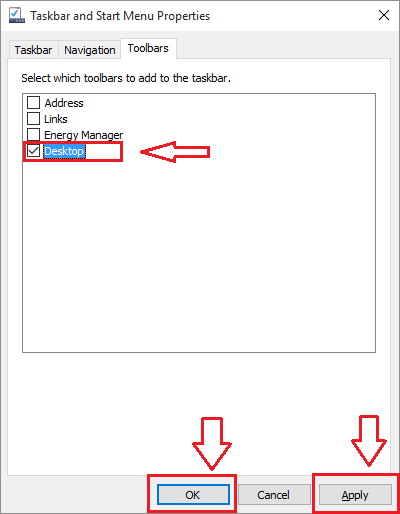 How to access any item directly from Windows 10 Taskbar : – As the Windows versions are getting higher and higher, the ease with which the system elements can be accessed is also getting higher. With it’s new features like Cortana, tweak design, customizable taskbar etc, Windows has definitely made things easier for the users by providing such user-friendly interfaces. 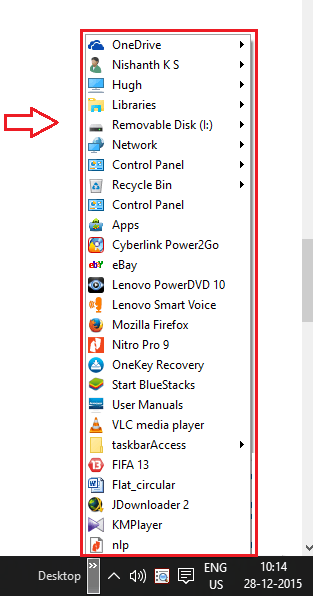 But if you can access every single item that your system has, from your own taskbar, wouldn’t that be super cool? Windows does have that facility available, you just got to find it and activate it. The Desktop toolbar is the one to look out for. It can be added to your taskbar within the blink of an eye, and once added, it enlists everything in your system in it’s expanded menu, where you get to access things from. Read on, to learn how to make things easier by making the best out of this super cool feature. 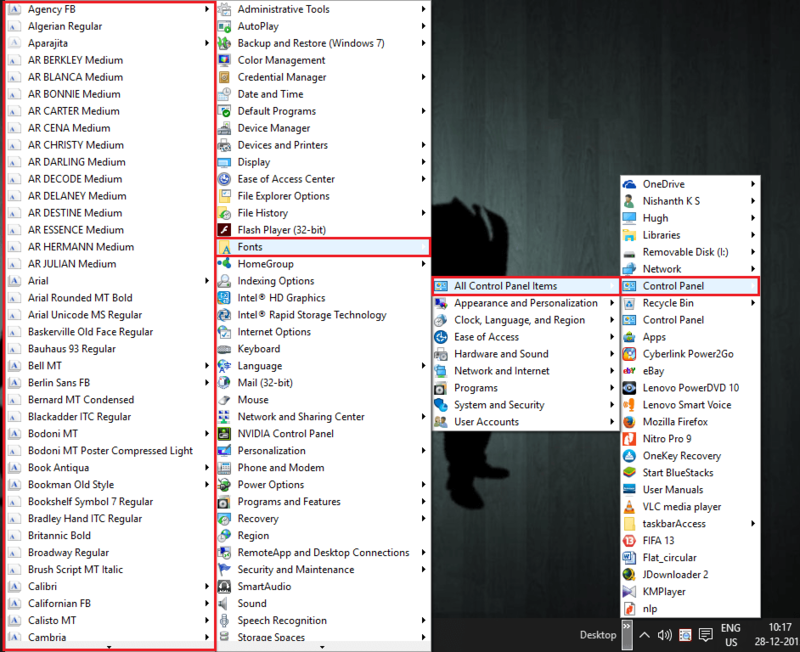 Find an empty space on your cluttered taskbar, to make a right click. From the menu that appears, choose Properties, which is the very last option. Now a new window named Taskbar and Start Menu Properties opens up, which has three tabs namely Taskbar, Navigation and Toolbars. Click on the very last tab, which is Toolbars. 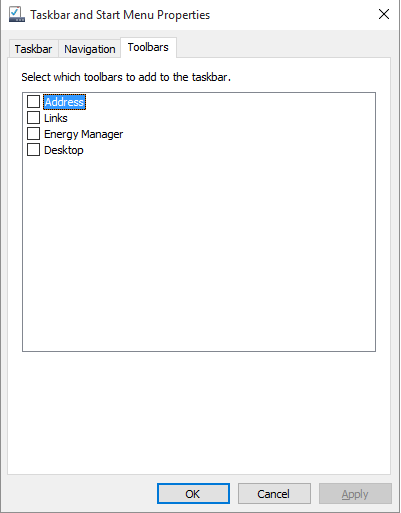 You will be given the option to select the toolbars that you want to add to the taskbar. Check the cell corresponding to the last toolbar option, which is Desktop. Now click on Apply to see the changes and then on OK buttons as shown in the screenshot. 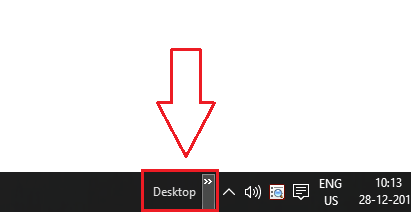 If you have a look at your taskbar, you will now be able to see that a new toolbar option has been added to your taskbar. Click on the arrow icon which is associated with the Desktop toolbar option. This will result in the listing of all the items like OneDrive, Control Panel, Recycle Bin, all Desktop items etc as shown in the screenshot below. Now you can click on the arrow corresponding to each of the items, if there is an arrow associated with an item, to expand the list of options and then to access any item from that list. In the below screenshot, as an example, I have expanded Control Panel first, then All Control Panel Items, and finally Fonts to view all the available fonts in the system. That’s it. Now you can access every single file in your system by clicking on one single space. Make yourself home with your brand new Windows 10.